In the pursuit of ending poverty for 5 million families by 2024, Gawad Kalinga reached out to nearly 4,000 University of Makati students to ignite in the hearts of the youth a fiery passion for nation building. For students, Saturdays are considered a much-needed break at the end of yet another dreary and difficult school week. It is a respite from waking up early, taking tests and doing homework. 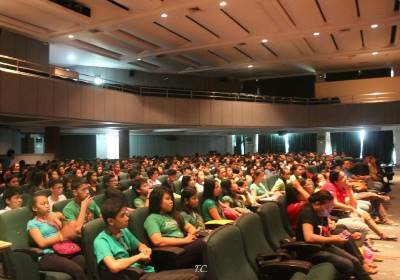 And for close to 4,000 students of the University of Makati (UMAK), August 31, Saturday became even more special as they learned about the efforts of Gawad Kalinga (GK) to change the world and how they, too, can challenge the impossible. On May 15, President Aquino signed into law the K to 12 basic education program mandating Filipino pupils to attend kindergarten, six years of elementary school, four years of junior high school and two years of senior high school. In line with this, the Department of Education selected UMAK, along with 50 other colleges and universities, to test pilot the program. The pioneer batch of Grade 11 UMAK students are also the first to be a part of the Youth Development Program (YDP) which aims to promote values formation and youth empowerment. 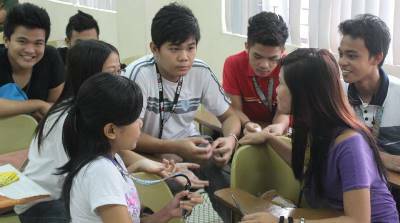 As part of the YDP, UMAK’s Design Center for Nation Building (DCNB) invited GK to develop a special magisterial class that would introduce to Grade 11 students the GK Way: being Makadiyos, Makabayan, Makatao and Makakalikasan. According to GK coordinator Franz Josef Hipol, the magisterial class is the latest joint activity of UMAK and GK, organized through the efforts of UMAK President Tomas “Tommy” Lopez. Franz explained that UMAK and GK first started working together in 2005 to empower the youth of today to become tomorrow’s leaders, innovators and visionaries. Other GK events hosted by UMAK include the GK1MB (GK Isang Milyong Bayani) concert rally in 2008 and GK Youth summits in 2009 and 2010. These projects helped entice over 150 UMAK students to be a part of GK Youth, including Grade 12 student Shilou Misajon who said that GK made a great impact on her life. More students were inspired by GK and the GK values of Bayanihan, Walang Iwanan, Padugo and Una sa Serbisyo; Huli sa Benepisyo during the magisterial class for nearly 4,000 students held last August 31 at the UMAK Main Theater. The activity began with an opening prayer by Sister Helen Grace Intia, followed by the singing of the national anthem and opening remarks by DCNB Executive Director Gil Tabbu. GK Youth volunteers kicked things off as they led a Unity Dance set to the song, “Lakas ng Pagbabago”. GK Executive Director Jose Luis Oquiñena, GK Head of Corporate and Shared Services Issa Cuevas-Santos and Executive Assistant to the Executive Director Matt Vergara were invited to speak about the important role of the youth in building peaceful communities, living out a culture of caring and sharing, and making sure that no one is left behind. Shilou was one of 60 GK Youth volunteers from UMAK that helped inspire fellow students to be a part of positive change. During the event, she confided her reason for joining the organization behind the activity. To reinforce the GK values and motivate the students to become heroes, 21 GK full-time workers and volunteers, GK Youth volunteers and UMAK faculty members then led one activity per class. Each class was divided into five groups, one for each of the GK values. They were asked to think of different ways to help the UMAK community and the country based on the value that was assigned to them. They shared their ideas through song, dance, skits and short essays. With this class, the students are reminded to care for their community, country and the poorest of the poor. By reflecting on what they can do for others, the students can understand that there are many simple and meaningful ways to help. They can also be a part of GK and participate in various volunteer activities to build safe and productive communities and end poverty for 5 million Filipinos. Gawad Kalinga (GK) is too big a story for one person to tell, and it wouldn’t be complete without the partners who have been with us throughout the years. You too can be part of this mission of ending poverty. If you want to be a GK mission partner, email info@gawadkalinga.com.